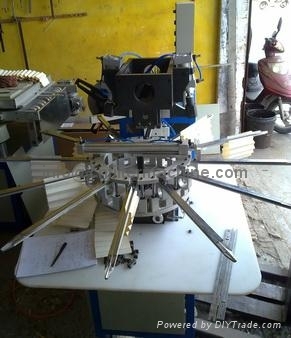 This machine is used for elements clipping with the steel strip. 1.The whole working process of the steel strip forming, loading, clipping, cutting, restarting is automatically finished by the PLC control pneumatically and mechanically. It is fast speed and high efficiency. 2.The steel strip clip the filter paper ends tightly to prevent the filter element from leakage. 3.The clipping height and width are easily to be adjusted and keep consistency as well. 4.The computer monitor control is used, which is easy operation. 5.There are 12 clampers and convey stations. It is fast speed and high efficiency. 6.This machine has the cylinder discharging device, which is highly automatic.